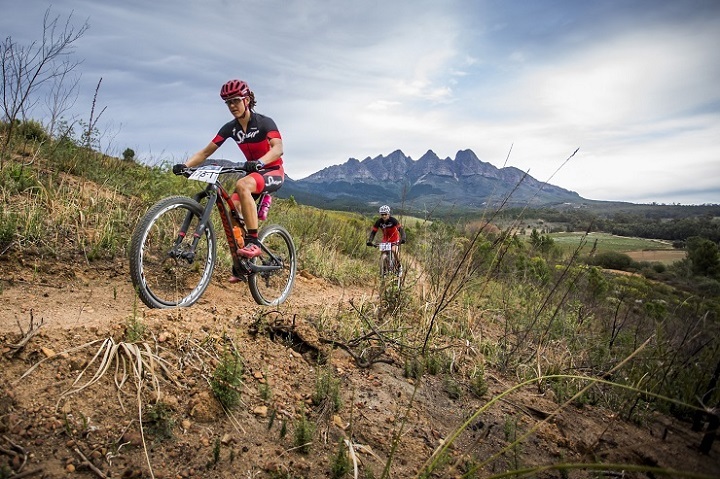 Swiss mountain-biking star Ariane Luthi will be the firm favourite to capture the PwC Great Zuurberg Trek women’s title when she teams up with South African ace Robyn de Groot for this weekend’s mountain-bike race. The popular Eastern Cape boutique event, which starts and finishes at the Zuurberg Mountain Inn about 70km outside Port Elizabeth, gets under way on Friday and finishes on Sunday. Riders will cover a total distance of 209km over the three days, traversing a variety of trails, which include sections in the Addo Elephant National Park. A former Cape Epic champion (two women’s titles and three mixed), Luthi, who has been competing in Europe since March, is back in South Africa for a short period and said she had jumped at the chance to partner five-time national marathon mountain bike champion De Groot at the event. “Although we have had lots of competition on the bike, we are very good friends and I’m delighted about this chance to ride with her,” said the Stellenbosch-based Luthi. Riding for Ascendis Health Spur, Luthi said she was looking forward to a race about which “I have heard only good things”. With a wealth of experience in South African mountain bike races, including the popular Winelands Encounter, Luthi has had a taste of riding in the Eastern Cape previously. “I did experience the Addo area in my first year in South Africa in 2011 when I competed in the Herald Cycle Tour mountain-bike race,” she said. The Swiss ace recently competed in the European mountain-bike marathon championship in Italy, where she was happy to take third place in the face of strong opposition. She said she was feeling strong physically and was looking forward to a competitive outing. Among their chief rivals will be Theresa Ralph and Sarah Hill, who linked up for the first time last year and showed their growth as a team by winning the joBerg2c last month. Ralph brings plenty of experience to the partnership, having won the Magalies Monster and the Kalahari Challenge last year, while the 24-year-old Hill is developing her potential as a stage-race competitor. In the men’s category, regular GZT contender Andrew Hill, from Durban, will be chasing his third title, in partnership with Shaun-Nick Bester. Riding for TIB-Silverback-Best4Sport, Hill said he had developed a nice partnership with Bester, a former road ace who has taken to the mountain-bike trails. “We started the sani2c, but unfortunately a mechanical put paid to that event,” said the Hillcrest rider, who won the GZT in 2015 and 2016. “I am definitely looking forward to this weekend because it is a top-class event. The riding is great and we are always so well looked after. Bester has shown his mountain-biking skill be winning the PE Plett team race and finishing third on the podium at the joBerg2C, partnering Declan Sidey on those occasions. Having conceded the title last year, Hill said their ultimate goal would be to “stand on top of the podium”. “I know there will be strong teams to contend with, so we will assess our situation after the first day,” he said. Race owner Siska van der Bijl said they believed there would be good competition in the men’s category. “The strongest are definitely Andrew Hill and Shaun-Nick Bester, but then you have teams like Joel Stransky and Andrew McLean, as well as Jason Peach and Jason Reed from East London, who are capable of doing well,” she said. “We also have two Port Elizabeth riders in Grant Daly and Nick Friend who are fairly new to stage racing. She added that there was also a serious competitive element in the mixed section. “Yolande de Villiers and Neill Ungerer will be back to defend their title, but they should have a good contest with Yolandi du Toit and Ben Melt Swanepoel, who recently won sani2c,” she said.